The finalists in the inaugural Travel Media Awards have been announced. See the list of finalists click here. Tickets to the Awards ceremony being held at the Renaissance St Pancras Hotel in London on 9 November are now available. The Travel Media Awards have been created to recognise excellence in the fields of travel media, travel writing, broadcasting and photography; over 500 entries were received for the 19 award categories for the 2015 awards. 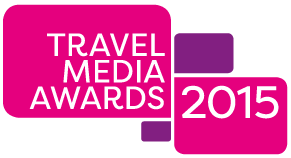 The Travel Media Awards are owned and produced under a joint venture agreement between Travega and APL Media.